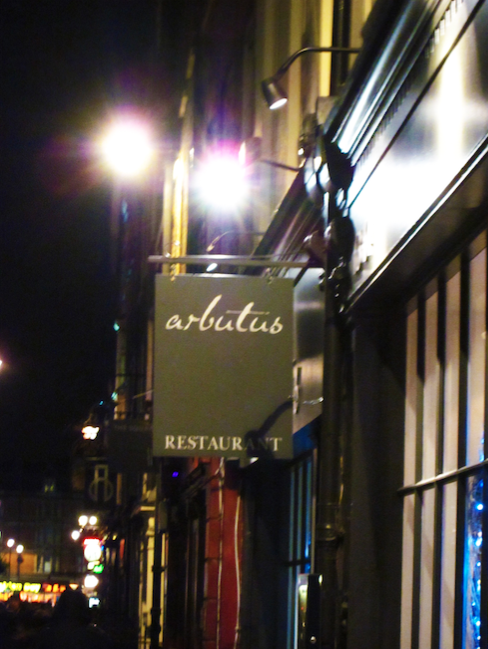 We got to know of Arbutus Restaurant from a friend of ours while out on a walk with him in the heart of Soho, London. He had pointed it out for its Michelin one-star status and suggested that it would make a nice place for me and the missus to check out on a date. We did just so by heading to there for dinner on 31 December 2011 under a two-hour time slot. The restaurant had required all diners to complete their meals within two-hours to accommodate other diners seeking a good celebratory meal on New Year’s Eve. Interestingly, Asians seemed to be over-represented among the restaurant’s dining crowd that evening. In London, one knows that a place serves good food by the number of Asian diners that a restaurant attracts on any given occasion. The more of them the better the food and value for money. The restaurant serves modern European cuisine and holds a philosophy of turning seasonal and inexpensive ingredients into interesting dishes. We had the three-course menu beginning with a Mediterranean fish soup and a squid and mackerel burger with bamboo clam dish for our starters. The Mediterranean fish soup had a comforting taste of bouillabaisse that reminded us of our travels in France. Our mains were a cod filet with crispy boneless chicken wings and a roast rabbit with cottage pie. Desserts were a bitter dark chocolate and clementine mousse and a Sicilian lemon tart. Our New Year’s Eve dinner at Arbutus whizzed by with quick and efficient service in a well-lit dining environment that gave our dining experience a clinical feel. On the flip-side, the food was delicious and inexpensive, which more than made up for everything. We don’t mind returning to Arbutus again.